My new shop is still a bit of a work in process. The new one is a 12'x22' basement room that replaces the old 12'x12' basement shop in our old home. I have three things to do before I will consider it completed. I started with a clean sheet and 30 plus years in my previous space. This first picture is of the west wall of the shop which is to left of the entrance door, which is in the corner of the shop. 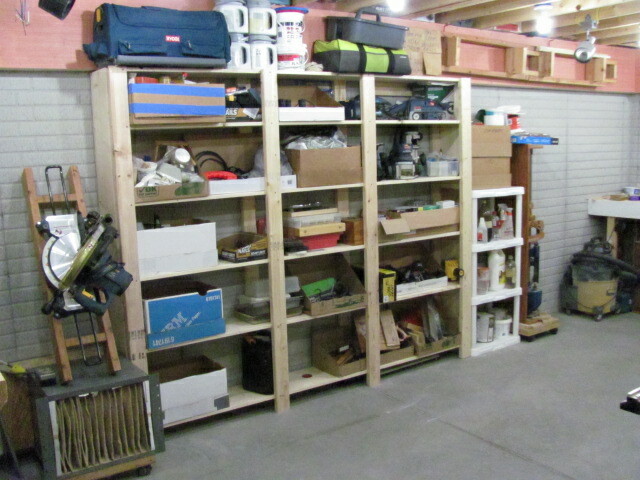 This wall is devoted to storage of wood (top two racks, my woodworking library, and the lower half is for the assembly table, a store horse, my 35" square WorkMate, and extensions of those two to raise working height to table saw and each other. I also store extension cords and vac hoses on a rod under the bookshelf. In the corner are boxes of painting and wall papering tools. 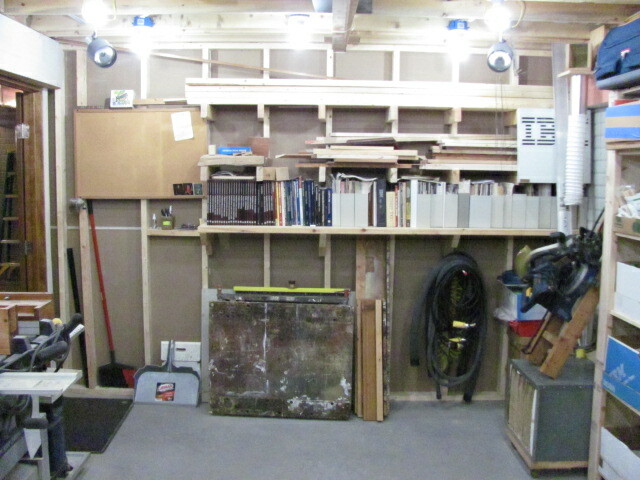 The next picture is the north wall which has the air filter on the floor with my CMS stored above it. The CMS is awaiting a wall bracket to hang it from when not in use. To the right of that is a 12" deep by 8' long shelving unit I built to hold tools, accessories, finishing products, and fasteners. All of the boxes are cut down to "bin" shape to keep the contents more easily visible. The white plastic shelving unit is temporary until I get its contents move into the wooden rack. My shop built lathe stores next on its rolling dolly. The 12 gallon industrial ShopVac is THE dust collection unit for all of the tools in the shop. 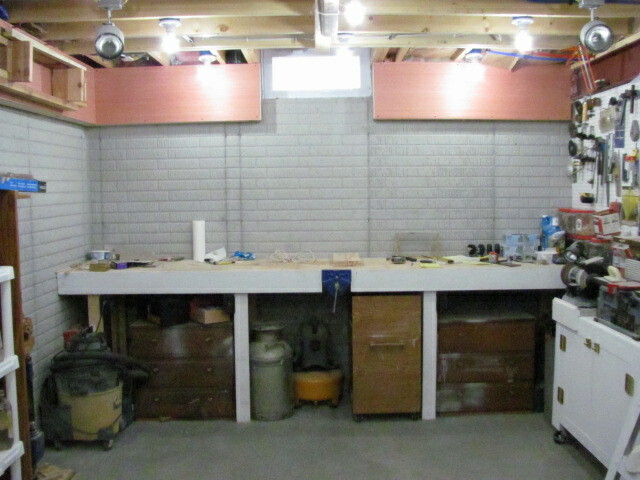 The next picture is the east wall and is where the 12'x30" work bench is located and attached to the walls and floor. The space under it is used for storage of "stuff" in the two chests of drawers. I also store my air compressor, shop stool (milk can), and the rolling clamp cart under the bench. There is an exhaust fan in the upper left joist space that vents to the outside. 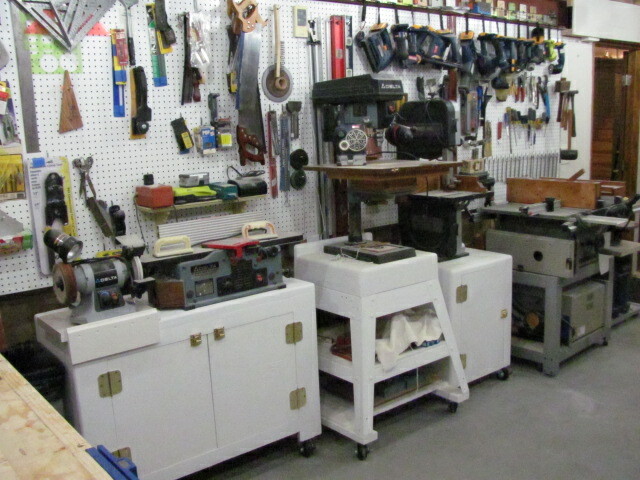 The last picture is of the south wall where I store all of my "stationary" benchtop tools. They all are mounted on rolling wood cabinets which serve as tool storage also. I use a square 30 gallon trash can next to the workbench as it takes up less room than a round one. It was a throwaway at work during a downsizing. The jointer cabinet has two shelves inside and is used to store some seldom used hand power tools. The drill press stand is an old table saw stand with shelves added to hold all of the accessories for the drill press. The band saw stand holds my oscillating spindle sander and extra band saw blades inside. The table saw stand holds a second saw in its lower shelf. The last tool on this wall is my 13' thickness planer and will have a cabinet similar to the band saw cabinet and will store the scroll saw inside. I'm still collecting scrap wood to build this cabinet. The top four feet of this wall is covered with peg board and covers 64 sq. ft. (not enough). Some of my 18 volt cordless tools hang from the I-beam on magnetic plates. My storage theory is to put little used things up high (even in the joist spaces) and keep often used tools and accessories in the middle. Heavy or bulky items go down on the floor level. This design is based on how I work in the given space. It gives me 17 1/2' x 8' of clear floor space, which is enough to work 4'x8' sheet goods. If I need more room, I can roll the machines on their castor-ed bases out of the way temporarily. The bench grinder, scroll saw, lathe, and OSS mount on the work bench for use. Electricity is two 20 amp. circuits, one for lights and one for power. The tool wall has outlets on every other stud and there are four under the work bench. Lighting is 17 60 watt equivalent LED bulbs spaced in three rows with each bulb 4' apart. There are also four 75 watt incandescent indoor floods on a separate switched circuit for color balancing when finishing. Dust collection remains my 12 gallon industrial ShopVac and the shop built ambient air cleaner. Last edited by Jim Frye; 02-23-2018, 08:40 PM. Looks like a nice space and you've obviously already done a ton of work on it. Welcome back by the way. Thanks for the shop tour Jim. It is nice to see I'm not the only one still using Ryobi. Thanks for the tour Jim. Wondering if there is any legs / bench corresponding to that CMS? If so, please post a picture or 2. And of course, WELCOME BACK! Ask and ye shall receive. The CMS main frame sits on my big WorkMate when in use. The picture below shows both extensions set off to the left to handle stock over 8' long. The extensions will bolt on either side of the saw. The legs are pieces of 3/4" ply clamped to the extensions. This rig was designed for job site use and uneven terrain. Also look back at the north wall picture above. You'll see the extensions for the CMS stored on hooks up by the joists. Each piece of this set up is 42" long and 10 1/2" wide. Hey welcome back Jim, haven't heard from you in ages, it seems. I like that you used regular door hinges on your mobile base cabinets rather than dinky hinges. They look “industrial” and will handle some weight if you use the backs to many stuff on, and if you do happen to put your weight on them when getting up from a kneeling position they don’t break off. I used the regular door hinges as I had over three dozen of them left over from a remodeling project at our previous home. I hung 6 panel oak doors throughout the house and they came pre-hung with the bright brass finished hinges. The project included antique bronze hardware, so the hinges got replaced with like finished hinges. The brand new brass ones were just not throw aways in my mind. From 12 X 12 TO 12 X 22 - almost double the space for the cellar. Lets see how you use that. Looks great. I have increased my shop size too. Feels GREAT! Congratulations! Awesome use of space. REALLY making me rethink what I wan to do with the SCMS.... And drill press, and.... you get the idea!